Last week I posted a photo of this brussels sprouts salad I made, and it had many comments asking for the recipe. So here it is in all its delicious glory! 1. Heat a pan with garlic olive oil, then add brussels sprouts in -- cut into halves. I did not microwave my sprouts. 7. 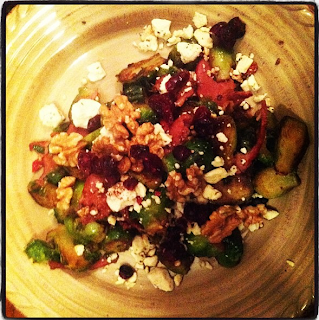 In a large bowl, add feta, walnuts and cranberries. Mix thoroughly and serve hot! I used a small handful of cranberries but you can add as many or little as you like. Hope you enjoy!